This is a 1 minute preview of a webinar. × Experiencing issues viewing video? Please clear your cache and refresh this page. 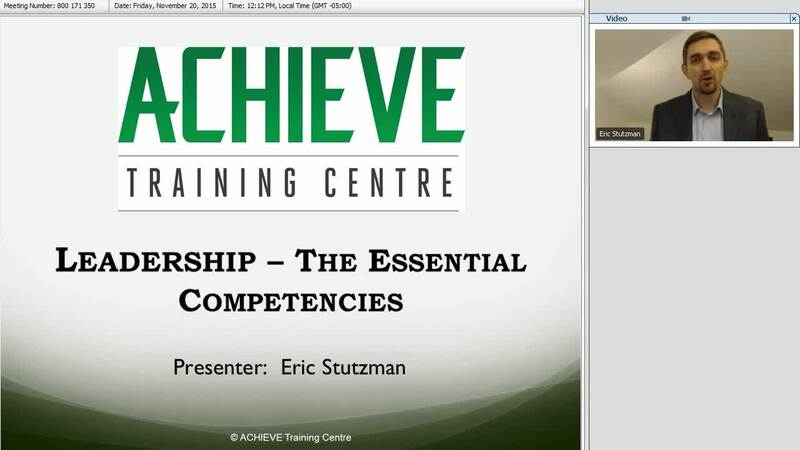 As Managing Director of ACHIEVE Centre for Leadership & Workplace Performance, Eric provides the overall direction for the development and delivery of ACHIEVE’s workshops and services. He has provided leadership in the field of conflict resolution and mediation since completing a degree in Sociology with a focus on mediation and peacemaking. Eric is a Chartered Mediator and currently President of the Alternative Dispute Resolution Institute of Manitoba. He has worked as an administrator, board chair, senior mediator, trainer and lead negotiator for other organizations in various parts of Canada. Eric believes that the best leaders and employees turn their minds first to listening with curiosity. He is co-author of the book, The Culture Question, and is the author of many of ACHIEVE’s workshops including Management and Supervision, Coaching Strategies for Leaders and Dealing with Difficult People. Eric is a gifted trainer who makes training material come alive for participants through humour and real world application. Essential leadership skills and competencies often mean the difference between thriving or failing in a leadership role. To lead effectively, there are some things that leaders must do and know, and not all of them will come naturally. This webinar provides strategies to help leaders increase their abilities to inspire and lead teams effectively. Viewers will gain insights about how to best engage others, assess team dynamics, make better decisions, and to improve trust and influence with those they are leading. When you subscribe to our newsletter you will receive a free Conflict Resolution Skills e-manual. We'll never share your email address and you can opt out at any time.